"There is a growing controversy on this subject and Mr. Miller needs to be heard." "This book is a MUST for all who have, or are contemplating having, children." "Mr. Miller points out the dangers of vaccines. His descriptions of each illness and delineation of the controversy are noteworthy." "Grounds for questioning the safety and efficacy of childhood vaccination programs are reviewed with clarity and thoroughness in this book." "Congratulations! Finally something to give patients who inquire about this overwhelming conundrum. I’ve told many people about this important contribution." Are vaccines really safe and effective? Ten years ago, a concerned father asked this very question. No one provided him with convincing evidence so he researched the scientific literature on his own and wrote a vaccine book that went on to become a bestseller (more than 100,000 copies sold). Today, this profound and compelling immunization handbook, "Vaccines: Are They Really Safe and Effective?," has been completely updated and revised. It contains 30 graphs and more than 900 references. This essential immunization resource is the most well-documented vaccine book in the world! "Vaccines: Are They Really Safe and Effective?" includes the latest information on ALL recommended childhood shots plus anthrax, smallpox, and flu. In addition, this remarkable vaccine guide...Evaluates each vaccine for safety, efficacy, and long-term effects; Includes the most recent studies and provides numerous case histories; Pinpoints for parents exact conditions that may put their own child at high risk; Documents correlations between vaccines and several new diseases; Outlines current vaccine laws and offers parental options to "mandatory" shots; Helps all concerned people to make wise and responsible decisions. When New Atlantean Press first published "Vaccines: Are They Really Safe and Effective?" some people opposed our efforts to educate parents and health practitioners. Of course, many others were deeply grateful. Today, this book has been translated into several languages. In addition, chiropractic colleges stock it in their bookstores and midwives recommend it to their clients. Many pediatricians and other doctors purchase this book as well. Often, they are surprised by the number of valid studies documenting vaccine hazards. This information was not taught in medical school. This book will continue to arouse strong emotions. It is well-written and well-documented. Furthermore, this latest edition of "Vaccines: Are They Really Safe and Effective?" is much more extensive than the earlier edition. For example, the previous book had 300 notes and references; this new book has more than 900 notes and references -- a threefold increase in researched data! The previous book had 12 illustrations; this new book has 30 charts and graphs. The previous book was just 78 pages; this new book has 128 pages -- nearly twice as much new information! This latest edition also answers many more questions than the earlier edition. For example, how are the vaccines made? Do they really contain thimerosal, a mercury derivative? Are the chickenpox and MMR vaccines manufactured in human fetal tissue? Do credible studies show correlations between the current autism epidemic and vaccines? These questions and many, many more are answered in this book. I wrote "Vaccines: Are They Really Safe and Effective?" so that parents and health practitioners may make more informed decisions regarding vaccines. I do not advocate them, nor do I presume to know what is best for other families. I merely try to present the facts in a clear and straightforward manner. After reading my book, parents often contact me to express their gratitude. They appreciate the simple format complemented by extensive research. Every statement in my book is referenced to a valid scientific study or other reputable source of data. Information that would have otherwise remained hidden is revealed so that you can make informed decisions. Some critics argue that I don’t believe vaccines reduced the incidence of disease. My "beliefs" are irrelevant. In some cases, no credible evidence supports this contention. In other cases, convincing arguments can be made for and against this basic claim. More importantly, several vaccines have been linked to new diseases. I thoroughly document these correlations. Thus, even if a vaccine is instrumental in reducing case numbers of a single disease, what overall benefit have we gained if it simultaneously causes two or three new ailments? For example, the polio vaccine has been scientifically linked to increased cancer rates, the Hib vaccine to rising diabetes rates, and the hepatitis B vaccine to serious neurological disorders. The studies are summarized in my book. Parents, you are responsible for the welfare of your children. Research this topic thoroughly until you are comfortable with your decisions. Can mandatory vaccines trigger developmental disorders and autoimmune diseases? Does the U.S. government secretly calculate how many people will be permanently disabled and killed from vaccines? Did AIDS originate in diseased monkey organs used to incubate polio vaccines? Are new viruses tested on unsuspecting vaccine recipients? How safe is your child from the near and long-term effects of these "miracle" shots? "Vaccines: Are They Really Safe and Effective?" (the new, completely updated and revised edition) is the most well-documented vaccine book in the world. It includes 30 charts and graphs plus nearly 1,000 citations so that all of the information may be confirmed. This bestselling vaccine handbook (more than 100,000 copies sold) evaluates each vaccine for safety, efficacy, and long-term effects. It contains the most comprehensive, up-to-date, uncensored data available — information that many doctors don’t even know. It includes the most recent studies, numerous case histories detailing vaccine-induced damage to children, and pinpoints for parents exact conditions that may put their own children at high risk. It includes information on vaccine ingredients, natural versus artificial immunity, and provides data documenting correlations between MMR and autism, polio vaccines and cancer, the hepatitis B vaccine and multiple sclerosis, the Hib vaccine and diabetes, and much, much more. In addition, it outlines current vaccine laws and offers parental options to "mandatory" shots. Polio vaccines were contaminated with cancer-causing monkey viruses and administered to more that 100 million people. Sixty-two studies from 30 laboratories around the world have linked these tainted vaccines to dramatic increases in brain tumors, bone cancers, lung cancers and leukemia (pp. 20-22). During the 1980s and 1990s, more than half of all measles cases in the United States occurred in people who were adequately vaccinated (p. 29). Surveys in medical journals indicate that up to 87 percent of pediatricians and family practitioners do not believe the hepatitis B vaccine is needed by their newborn patients (p. 51). A recent study in the Journal of the American Medical Association has linked the chickenpox vaccine to serious adverse events, including neurological disorders, immune system damage, and death (p. 54). A recent study in the British Medical Journal has linked the Haemophilus Influenzae Type B (Hib) vaccine to rising diabetes rates (p. 58). The new anthrax vaccine for humans is designed to protect monkeys against one strain of anthrax. Yet, researchers have documented more than 1300 strains of anthrax (p. 70). According to the FDA, thousands of children are damaged or killed by vaccines every year. Families of vaccine-damaged children were recently compensated more than $1 BILLION (p. 102). Parents, educators, and health professionals have very few sources of information permitting them to make informed choices regarding vaccines. But concerned parents are pleading for answers to their many questions. Doctors only tell them one side of the story; there is another side. "Vaccines: Are They Really Safe and Effective?" tells the other side and helps all concerned people to make wise and responsible decisions. Includes information on ALL recommended childhood shots PLUS anthrax, smallpox, and flu. This is the only book I've found that was not written by a doctor. Amazingly, it seems to me to be the best information I've found. Pro-vaccine books don't seem to make a very strong case for getting the shots. They tend to cling to the declining disease rates as the primary evidence of effectiveness. Neil Miller's two books debunk this argument rather well. Pro-vaccine books also focus more on the diseases as they existed during the height of their epidemics, rather than the reality today. They tend to gloss over (or ignore!) adverse side effects, both in frequency and severity. The doctor written books against vaccines take a sort of willy nilly approach to this highly political and emotionally charged subject. One said avoid the MMR, but get the DPT. Another said avoid DPT but get the MMR. In all cases, when they recommended a particular shot they glossed over specifics of safety and effectiveness, and instead focused on the dangers of the underlying diseases. But Neil Miller clearly explains what the dangers of these diseases vs. the dangers of the vaccines for each disease. He also clearly argues against the effectiveness of vaccinations generally, and the surpising lack of science behind vaccines. He also touches on how the corporations that make money from them have manipulated public opinion and the government, and how the statistics have been manipulated to under report adverse effects of vaccines. His books are excellent. I would recommend them to everyone, both for and against shots. Get as many books as you can find would also be my suggestion. Read and think for yourself. FYI, it wasn't very hard for us to find several doctors that would support our decision not to vaccinate. One doctor only gave the shots to kids when parents insisted on them. Neil Z. Miller is a medical research journalist and natural health advocate. He is the author of numerous articles and books on vaccines, including "Vaccines: Are They Really Safe and Effective?," "Immunization Theory Versus Reality," and "Immunizations: The People Speak!" He is a frequent guest on radio and TV talk shows, including Donahue and Montel Williams, where he is often seen and heard debating doctors and other health officials. Mr.He lives in Northern New Mexico with his family. Mr. Miller began his crusade against mandatory vaccines when his son was born. Very little data could be found on this topic. His search for the truth led him to scientific journals. There he discovered numerous studies warning medical practitioners that vaccines are often unsafe and ineffective. His shock and anger at the suppression of this information culminated in his passionate advocacy of health freedom and informed parenting options. 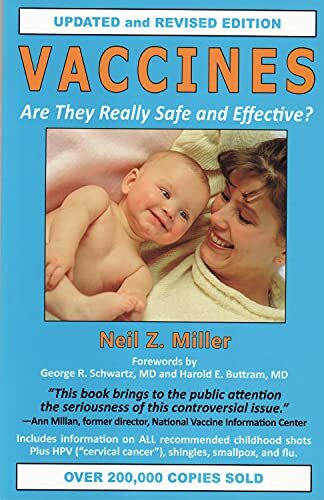 Neil Miller is a health pioneer who presented documentation about vaccine safety and efficacy problems long before these concerns were made public. For example, several years ago he complained about toxic mercury being put into childhood vaccines and provided evidence linking vaccines and autism. During the past decade, cases of autism skyrocketed by more than 500 percent in countries that use the MMR vaccine. In some parts of the United States, one of every 150 children is autistic. Recently, Congress commanded the FDA to remove mercury from vaccines, and new studies by several world-renowned scientists confirmed an MMR-autism link. "Every year, more than 12,000 people in the United States -- mostly children -- report serious adverse reactions to mandated vaccines. The FDA estimates that this represents just 10 percent of the true rate. Yet, even these figures pale in comparison to the number of cases of new diseases now being scientifically linked to inoculations: MMR and autism, polio vaccines and cancer, the hepatitis B vaccine and multiple sclerosis, the Hib vaccine and diabetes, to name just a few. For these reasons, among others, I am opposed to mandatory vaccines. I do not recommend for or against the shots. I want everyone to think through this enigmatic and controversial subject on their own. I believe that parents are capable of obtaining the facts and making knowledgeable choices regarding the care and welfare of their children." Mr. Miller has publicly debated the pros and cons of mandatory vaccines with several pediatricians and other health practitioners, including the chief medical epidemiologist for the National Immunization Program at the Centers for Disease Control and Prevention (CDC). He conducts lectures throughout the United States and is available to discuss his research on vaccines.